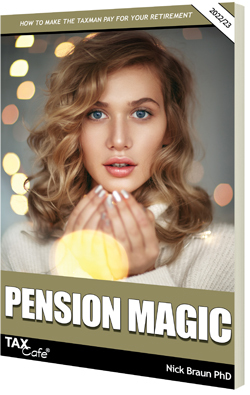 Pension Magic shows you how to build a big retirement pot by claiming thousands of pounds of extra tax relief on your pension contributions. The 8th edition was published in May 2018 and is completely up to date for the current 2018/19 tax year. The guide contains full details of ALL the major pension changes that have taken place over the past 24 months and is still completely up to date following the October 2018 Budget. Excellent source of up-to-date information about how to take full advantage of UK personal pension rules to maximise tax relief. Clearly written and supported with a great number of explanatory examples - makes this dry subject easy to understand. I was looking for a straightforward explanation of the benefits of using a Pension as a tax saving vehicle and this book did not disappoint. What I particularly liked was the way the book makes copious use of real world examples which really helps to understand what is being said. This book has my highest recommendation - it saved me money! All relevant tax and pension changes announced in the most recent Budget. Why pensions are still the best tax saving device for salary earners and business owners... with full Government approval! Why higher-rate taxpayers will typically enjoy 41.67% more income by putting their savings in a pension instead of an ISA. Why pensions are now one of the best inheritance tax shelters and can be used to pass wealth tax free down the generations. How a couple can increase their retirement income by over 30% by correctly choosing who makes pension contributions. Pensions vs buy-to-let - Detailed examples showing the benefits and drawbacks of using your pension savings to invest in property. How to boost your income by 77% by investing in a Lifetime ISA first and then a pension, thereby enjoying two rounds of tax relief! How to make a backdated tax relief claim (a quarter of higher-rate taxpayers do not claim all the tax relief they are entitled to). How parents with child benefit can get a tax refund of up to £72 for every £100 they invest in a pension. How to enjoy income tax relief and national insurance relief (including the 13.8% paid by your employer) with a salary sacrifice pension. How basic-rate taxpayers can increase their pension pots by 33% by postponing their pension contributions. How to calculate your ideal pension contribution (the one that saves you most tax) if you are a higher-rate taxpayer. Pension strategies for high income earners (income over £100,000 or £150,000). Why getting your company to make pension contributions is now better than making them personally. Why company pension contributions are a highly tax-efficient way to extract money from your business. Pension tips for sole traders and other self-employed individuals. The benefits and drawbacks of putting commercial property into a pension. Everything you need to know about “auto-enrolment” - the new compulsory pensions for employees. How to give your children or grandchildren a retirement pot worth over £1 million. Full details of the new Pension Freedom rules, including the new "flexi-access drawdown", "uncrystallised funds pension lump sum" and money purchase annual allowance. How landlords can reverse the cut in mortgage tax relief by making pension contributions. How to avoid being hit by the pension recycling rules. The lifetime allowance - how it works and whether you are in danger of exceeding it. Pension Magic - Professionally printed by one of the UK's leading printers.